Play was extremely important to my parenthood ideology, and I relied on the weekly games that Babycenter sent me during the first year of my son’s development. Their simple activities like water play and bubbles, and tummy time and so many easy activities in a non-verbal , pooping and peeing being were invaluable. Even though I am a doctor (Ophthalmologist) and my mom a Paediatrician, and I knew the developmental milestones, it really helped give me direction to what I can do with my 5 month 3 week old baby. Yes, they were that specific, literally every week-wise activity was spot on in terms of my sons milestones. Next came the one year to two year stage. And I didn’t have to buy ANY toys for the second year, since we got lovely-lovely toys during his first birthday celebration. By then the Babycenter activities had become broad activities and I stopped relying on it to make my gaming choices for my son. I went with my motherly instinct fuelled by a healthy dose of scouring the internet for blogs by moms ( yup like mine) and mom help groups. We loved our Building blocks, we loved things that moved particularly cars , and my sons love for cars, prompted me to write a blog post on why the obsession of Cars for boys read HERE. Hind sight is 20/20, and just as my son turned 2 , I knew that I was in the perfect position to look back on the year gone by and say what toys worked and which didn’t. clearly soft toys didn’t work for him, had never worked for him. Neither did he like the walkers and push pull toys, he was more of a grabber and thrower. We loved our sorting shapes , we also loved picture books, and games with stick on Velcro , they come in book forms as well but we loved the stick on ones by flintobox. Now to Flintobox, I had first heard about it from a lot of other mom influencers , whose children were a little older than my son. the boxes are meant for 2-3 year old, and then 3-4 year old. But being a type A personality mom , I got my son his flintobox subscription at 18 months itself ( what was clearly meant for 24-36 month ). And I have loved them enough ohave a box of goodies every month for him, since then. 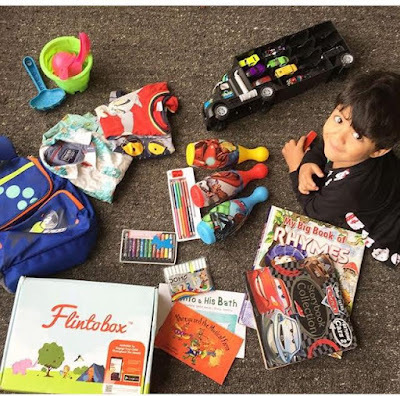 I love 5 things about the Flintobox, first that it’s a beautiful pack of gifts which are like a surprise every month, and I love surprises myself, so does my son! second, it was a gender neutral play , many of his toys were cars and yes at last count we have 150 vehicles in our house, enough for a traffic jam of our own, but I want to expand his horizon beyond the four wheels, and I loved the underwater theme, and the vegetable garden theme, also the rainbow coloured theme boxes. Which takes me to my next point, about themes. A lot of schools now have moved to the Montessori style of teaching according to theme, and I was happy to see some of the themes overlapping with his school activities, so when he learnt the rainbow colours, he stuck rainbow coloured shapes on his cloud shaped sun catcher which he got in the flintobox . 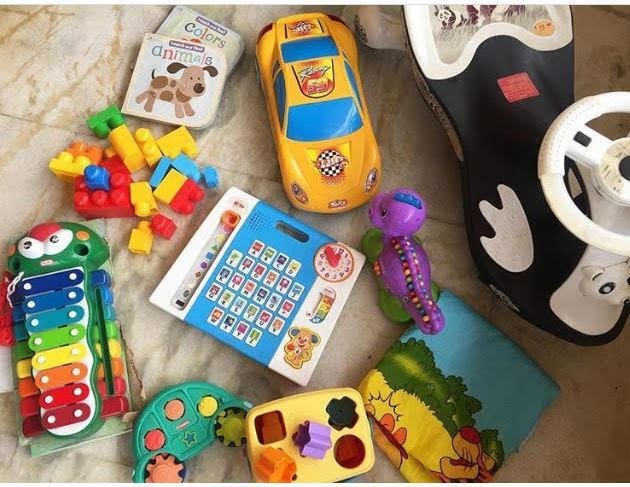 Next what I like is that every box comes with one painting activity and one story book , one activity for fine motor movements ( like sticking and picking) and all these help in overall development from language to motor skills. And as a busy parent I appreciate that every painting kit comes with the dry mat, gloves, containers to hold water, and all the other accessories which many kits expect the parents to get separately. As the kids grow, they get more independent with their play, they make friends, and suddenly you aren’t your kids favourite play mate, or only play mate. Playing with other children is as much a part of his gaining roots and wings as anything else in life. I love to see their cute imaginary worlds, and how they learn to follow rules and give another a chance , the dynamics on the play ground is something which has fascinated me before and I have blogged about it Play Ground rules. With time, I have gotten busy with work, as I am sure other moms and dads, for whom their newborn and infant was the center of their lives have gotten on with either work, or some having a second child, and slowly play becomes something that the child either does with his siblings or other kids, and not something a parent needs to be actively participating in. I hope I don’t reach that stage, I hope we enjoy years of playing scrabble, monopoly, and Uno, and I am so looking forward to teaching him games from my own childhood. Another popular proverb is “ it is not Child’s play” , but then Parenting can truly be about child’s play. What say ?